Insofar as internet search interest in particular insects reflects infestation levels, it seems summer 2010 is a banner year for our little cimicid friends. 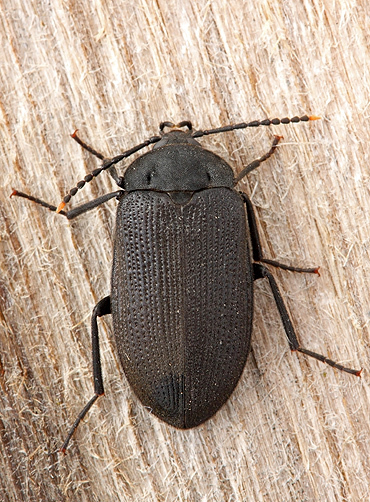 Peaks occur every summer as rising temperatures increase both the reproductive rate of the bugs and their motility. 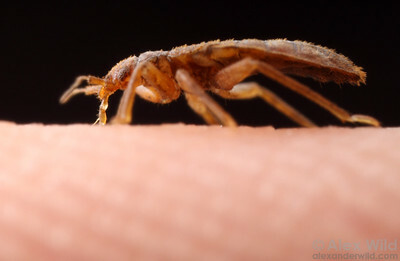 Incidentally, it’s a shame Gawker can’t seem to figure out what real bed bugs look like. I certainly wouldn’t mind an infestation of stag beetles. That’d actually be kinda cool. 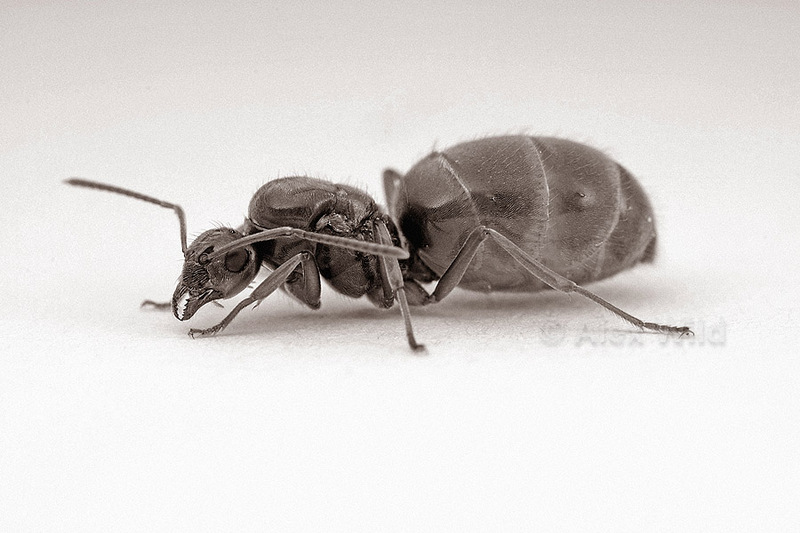 A few days ago I posted a photo of a Prenolepis ant queen. It’s a decent photo, in focus and properly exposed. But probably not anything I’d print out and hang on the wall. Check out the monochrome version above, though (click on it to enlarge). I don’t often put my images through such severe levels adjustments, but this one works rather well. I prefer it to the original. A couple years back I was working on the Beetle Tree of Life project as a molecular phylogeneticist. My main responsibility was to gather DNA sequence data for several hundred beetles distributed across the spectrum of Coleopteran diversity. As I’m not a Coleopterist, I spent most of my time lost in a befuddled daze of incomprehensible taxonomy. There are so many beetles. The larger families each hold more species than all of the vertebrates combined. Think about all the mammals and birds you know- the warblers, the polar bears, the shrews, the hummingbirds- and they don’t even add up to a quarter of the weevils. That’s just the weevils, too. Never mind the ground beetles, the rove beetles, and the leaf beetles. I did what I could to learn about these insects. I started the Friday Beetle Blog during this time, for example, and I’d try to look up information about the species I was sequencing. At least so I might know what they looked like. Nonetheless, Polyphaga defeated me. I just couldn’t stay ahead of the endless flow of incoming samples, and the list of species in our sequence database just got longer and longer. I’d recognize the names of most of the things just from typing them out all the time, but couldn’t keep else much in my head about them. 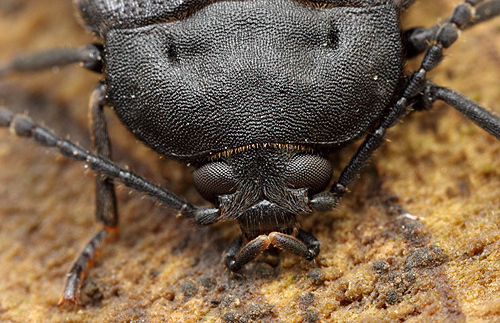 One of the hundreds of beetles I sequenced was the polypore fungus beetle Penthe pimelia. I always liked that name, it would pleasingly emerge within the Tenebrionoidea in our phylogenies. Other than that, I couldn’t tell you a thing about it, not with dozens of other tenebrionoids to worry about, and hundreds of other polyphagans and so on. So I’m pleased to report that, all on my own, here in Illinois, I’ve found Penthe pimelia. This is what they look like- velvety black, not quite as long as a penny, and painfully shy. This one was hiding out in a rotting log, presumably feasting on fungus. 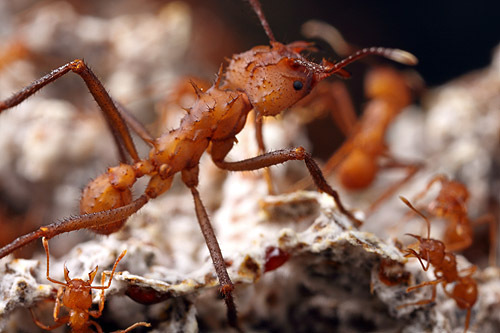 One of the world’s worst invaders, the little fire ants have spread from the new world tropics to warmer regions around the globe, becoming especially problematic on oceanic islands. The ants above, though, are from an innocuous native population in northern Argentina. They arrived at a cookie bait at the Costanera Sur reserve, barely noticeable specks of orange just over a millimeter long. 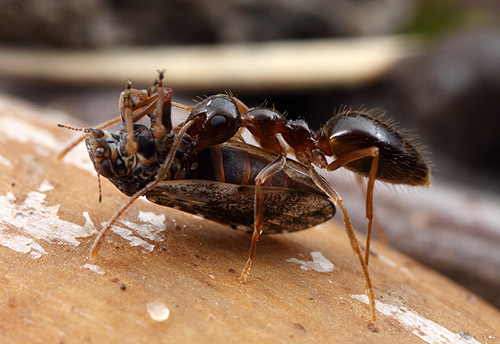 Wasmannia has a painful sting for such a small insect, and the ants do this annoying thing where they’ll wander around on your body for an hour or two before deciding to stick it to you. So there you’ll be, relaxing at the bar long after getting in from the field, and ZAM! Right between the shoulder blades. A big day for ant evolution! The Ant Tree of Life research group (AToL) has published their dolichoderine phylogeny in the journal Systematic Biology. 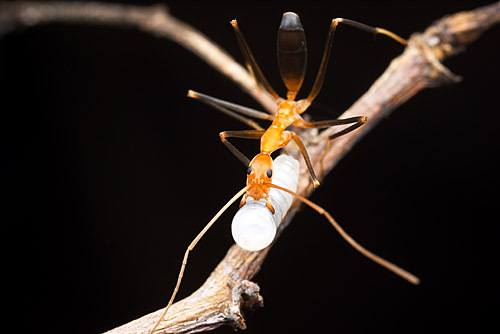 Dolichoderines are one of the big ant subfamilies, comprising just under ten percent of the world’s ant species. 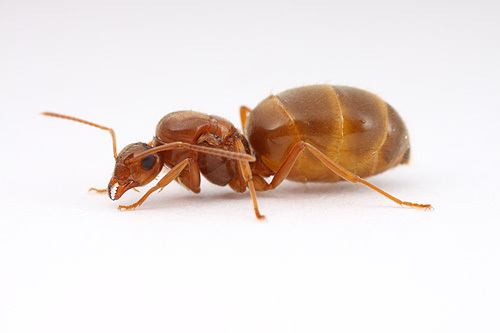 These are dominant, conspicuous ants noted for having ditched the heavy ancestral ant sting and armor in favor of speed, agility, and refined chemical weaponry. Most dolichoderines live in large colonies with extensive trail networks, and they fuel their frenetic lifestyle through copious consumption of hemipteran honeydew. “Ah, an easy one!” you might think. But no. I’m only handing out 4 points for identifying this common Illinois ant species. I’m more interested in this ant’s quarry, for six points: 2 each for order, family, and genus. First correct guess in each category gets the points. The cumulative point winner at the end of April gets an 8×10 print from the gallery, or a guest blog post on a topic of their choosing.